This big eye Latina mermaid has a reddish orange flapjack octopus friend. She has large brown eyes and a gothic feel. Her hair is a blue black with streaks of maroon. 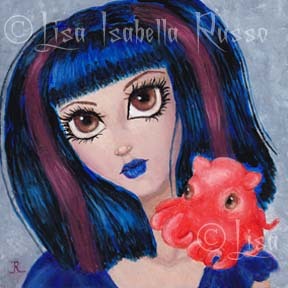 The flapjack octopus looks like it is perched on her shoulder. I did a solo piece of a flapjack octopus in the same format here. I hope to develop this theme for a larger painting at some point. This fantasy art piece has a lowbrow surrealist feel. It measures 4"x4"
Due to the square format of the original, I have altered the print versions. 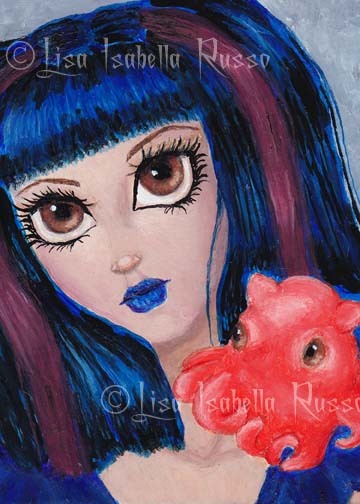 It is available as 5"x7" Open Edition giclee prints as shown and as 2.5"x3.5" Limited Edition ACEO giclee prints. The ACEO edition is limited to 25. Shipping reflects U.S. prices only, International buyers please contact me for a quote based on your location.